This compact, easy-to-use manual will help you gather and organize the information you need to process and document your most common probate actions. 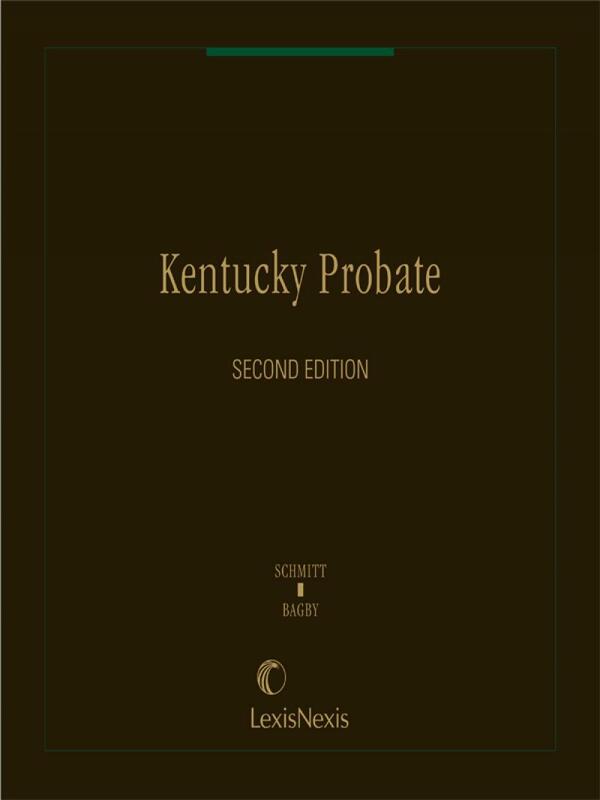 It includes an overview of Kentucky probate basics, fact-gathering data sheets for recording vital information, steps for completing the administration of a decedent's estate, sample letters, sample forms, and much more. W. Allen Schmitt, an attorney and former judge, had over sixty years experience in the practice of law, of which more than thirty years were concentrated in the probate field. In 1966, he served as president of the Louisville Bar Association, and during the fiscal year of 1970-1971, he was president of the Kentucky Bar Association. From 1962 to 1970, he presided in the Jefferson County Court as Probate Judge. During that time and afterwards, he was a frequent lecturer at various events conducted by the Louisville Bar Association and the Kentucky Bar Association. He was author of numerous articles in his chosen field for publication in the Kentucky Bar Journal and the Louisville Bar Bulletin. During the years 1972 to 1977, he acted as chairman of the Probate Committees of the Kentucky Bar and the Louisville Bar. These committees were responsible for preparing and submitting new and remedial legislation in the Will and Estate field to the Kentucky Legislature. Schmitt was a fellow in the American College of Trust and Estate Counsel from the years 1972 to 2004, and for five years he served as Chairman of its State Committee. 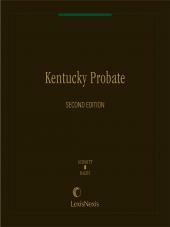 In 1981, he authored the first edition of the book, Kentucky Probate, and in 1995, he was commissioned to write a second edition which was published in 1997. Glen S. Bagby was admitted to the Kentucky Bar in 1969 and after five years in general practice, three of which were as Assistant Commonwealth Attorney, he turned his attention primarily to civil litigation including divorce, business practice and estate planning and administration. He was counsel in the landmark case of Gentry v. Gentry, a divorce case, wherein the Kentucky Supreme Court first upheld enforcement of an Antenuptial Agreement in a divorce proceeding in Kentucky and also was attorney in the case of Daniel v. Daniel in which the Court first interpreted the "marital effort" concept in non-marital property in Kentucky. Bagby served as Chancellor for the Kentucky Conference of the United Methodist Church from 1976 to 2001 and has written numerous legal articles including the chapter on Spousal Rights for the University of Kentucky Course of Law CLE Handbook, various treatments for the Kentucky Bench and Bar and a client information handbook entitled Estate Planning and Wills in Kentucky, published during 1995. He has co-chaired the annual Midwest/Midsouth Estate Planning Institute at the University of Kentucky School of Law for more than a decade. The professional organizations of which he is a member include the American Bar Association, Kentucky Bar Association, and the Fayette County Bar Association. His specialty associations include American College of Trust and Estate Counsel, Bluegrass Estate Planning Council (Past President) and Kentucky Bar Probate and Trust Committee (Past Chairman). Mr. Bagby is admitted to practice in Kentucky State Courts, United States Supreme Court, United States Tax Court and United States Court of Claims. He is a partner in the law firm of Dinsmore & Shohl, L.L.P. in Lexington, Kentucky, and is nationally listed as having expertise in the fields of Trusts and Estates and Family Law.  J. Robert Lyons, Jr. was admitted to the Kentucky bar in 1980 after acquiring his J.D. 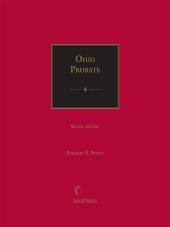 from the University of Kentucky College of Law. He practices in the area of probate administration and litigation and estate planning, corporate and business planning and business and commercial litigation, family law practice and appellate litigation. He was co-counsel in the Kentucky Supreme Court case of Gaskill v. Robbins, a divorce case which established that personal goodwill in a professional practice is not marital property. He was also co-counsel in the Kentucky Supreme Court case of Lach v. Man-O-War, LLC, which held that the two general partners in a limited partnership breached fiduciary duties in converting it to a limited liability company. The professional organizations in which he holds membership include the American Bar Association, Kentucky Bar Association and Fayette County Bar Association. He is admitted to practice before all Kentucky state courts, the U.S. District Court for the Eastern District of Kentucky, the U.S. District Court for the Western District of Kentucky, and the U.S. Court of Appeals for the Sixth Circuit. He is a partner in the law firm of Dinsmore & Shohl, L.L.P. in Lexington, Kentucky.